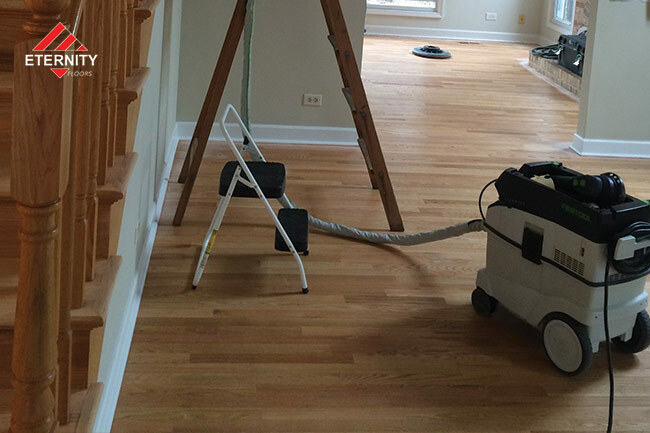 Getting rid of the old surface and flattening out your wood floors, sanding and refinishing will make your floors look brand new. 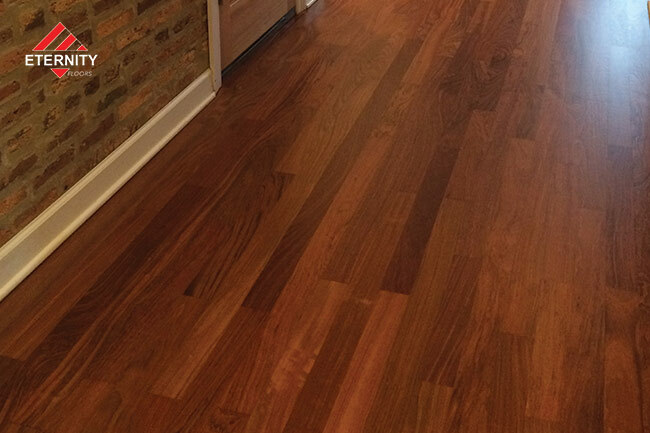 Many years of foot traffic, furniture scratches, and natural decay will wear the coating and finish off of your floors. 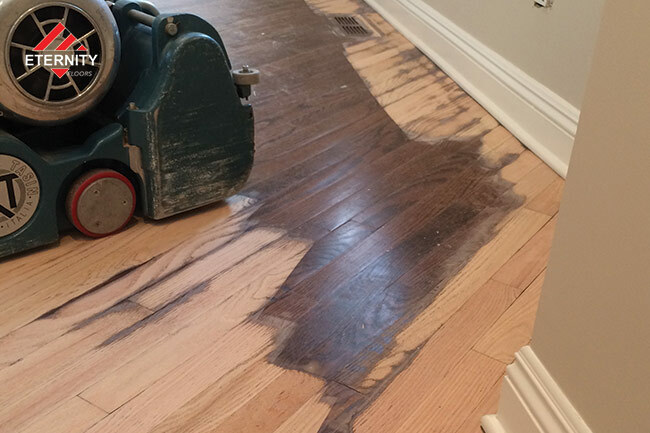 The process of refinishing includes completely sanding off the old finish down to the bare wood floor and making the floor’s surface level. At this point you can change the existing wood to the color of your choice as well as repair cracks, remove stains or correct minor imperfections in the wood. The next and final step is to apply a new protectant sealant to maintain the genuine beauty and elegance of your floor. Consider this option if the finish of your floor is not entirely worn through and if it has a dulled surface with only minor scratches or imperfections and no stains. Refinishing is easier to do than replacing the flooring, requires less time and is less expensive. Also, the cost of refinishing can be done for far less than the cost of replacing your wood floors. At this point our technicians are ready to bring in the big machines, edgers, rotary sanders, and even vacuums to begin the sanding process. If requested, we will provide you with stains you can choose from to add color to your floors. If you are really particular about a certain shade or tone you want your floors to be, we will provide you a complete custom staining service, which entails working with you to create a customized stain for your floors. 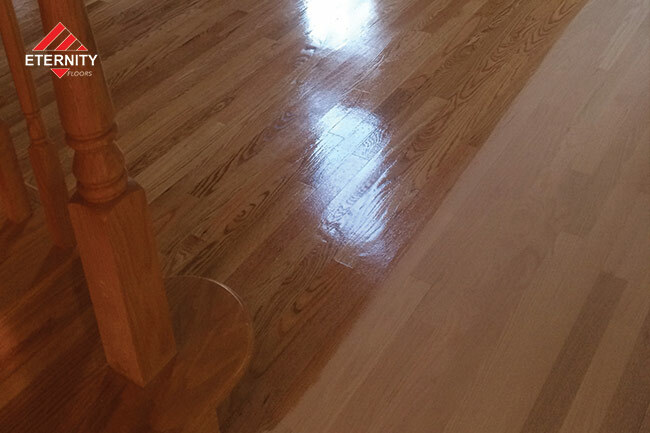 Lastly, we will coat your floors with 3 stages of polyurethane water-based or oil-based finish. You have the option of choosing the sheen (matte, satin, semi-gloss, or gloss). We use one of the most reliable product to ensure your floors have great durability. Eternity Floors, Inc. is an excellent company. They did a wonderful job of stripping my floors. Ulian and Sebastion were very professional and did a beautiful job. They also gave me information on how I can keep my floors looking good. I would recommend them to anyone.